In 2003, a nationally televised documentary exposed a relatively unknown sport, art form, and way of life onto the British public. The documentary, Jump London (Channel 4, 2003), introduced many to a form of urban acrobatics, derived from our Francophone neighbours, which formed the gateway for a new past-time to be infectiously taken up across shores all over the world. Its name is Parkour, from which Freerunning was derived, and from this recreational phenomenon was born a star in Sébastien Foucan. Most commonly known for wowing audiences on the big-screen in the James Bond film, Casino Royale, Sébastien’s hints, tips, and breath-taking tricks are now available for all to see on FreerunningTV.com. Stephen recognises that, in order to survive in the digital space, FreerunningTV has to be responsive, and flexible enough to react quickly to the market. The website has mirrored this philosophy as it initially offered some content for free with the full experience only open to paying members. However, the subsequent response from the community was almost universal: “We love it, we want more, but we want it for free!” So the paywall must to come down. 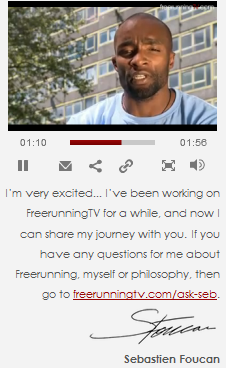 Stephen knows that his audience is largely made up of freerunners who, due to the unique nature of Freerunning, participate in an activity/sport with no ‘paid-for advantage’ such as entry fees, equipment, training or facilities. They are therefore resistant to paying en masse for anything related to Freerunning, no matter how high its perceived value. As a result, being an Express $499 customer, FreerunningTV are removing their paywall and are working with Tremor Media’s ad integration network to monetize the site purely through ad revenue. The site will be free-to-air this September. The Freerunning team is touring Europe this August so we can look forward to new exciting footage on the website from September. You can also follow Sébastien and the gang throughout the tour on Facebook and on Twitter at @FreerunningTV. FreerunningTV, you are August 2010’s Express Customer Highlight – we salute you!